Owing to our countable experience of the industry, we have been able to manufacture supply and export a range of Hydro Pneumatic System. Congruent with industry laid guidelines, these cables are available in various specifications and also in customized range to meet the specific needs of the customers. Our team make use of advanced machines and high grade material procured from the reliable vendors of the market in manufacturing them. Manned by a team of sincere and skilled professionals we are today counted among one of the leading providers of a wide array of Hydro Pneumatic Pressure Boosting Systems. Manufactured using optimum quality raw materials along with sophisticated machinery, they are tested by our experts in defined parameters. With the support of our vendors, we are able to provide our clients with finely engineered Pressure Boosting Hydro Pneumatic Systemwith finest quality-approved raw material to satisfy the demands and needs of our clients supplied by our eminent vendors in the market. In addition, the products which we offer are corrosion resistance, have long durability and it reduces the amount of friction and is perfectly manufactured to blend in with giving excellent output. Ideal for pressure boosting without overhead tanks. 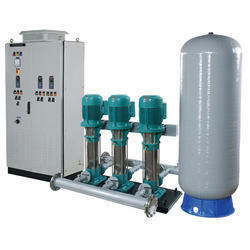 We are recognized as leading providers of a wide assortment of Hydro Pneumatic System. 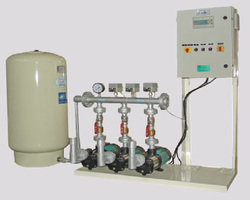 These hydro pneumatic systems are manufactured using good quality material and as per international quality standards and can be availed from us at market leading price. 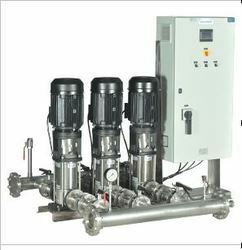 Lubi Subpack 1000 booster sets are designed for the transfer and pressure boosting of clean water for community water supply, apartment complex, hotels, hospitals, industries, commercial buildings, schools, bungalows etc. Description : These pumps are automatically operated according to system requirement by means of pressure switches one for each pump.the setting of the pressure switches have to be with in the optimal performance area of each pump model. The pumps sets consist of 2 -4 identical vertical multistage pumps mounted in parallel on a common base frame. 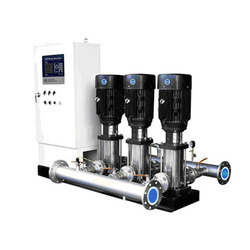 These pump sets are designed for the transfer and pressure boosting of clean water of community water Supply apartment complex ,hotels hospitals industries commercial buildings schools. 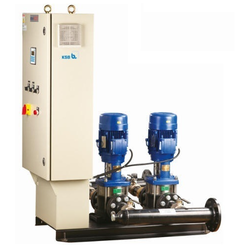 Function – These pumps are automatically operated when a tap is opened water is taken for the Diaphragm tank . Then the pressure drops to the first cut in pressure and the first pump is cut in As the consumption rises more pumps will be cut in until the performance of the pumps in operation Corresponds to the requirements When the water consumption falls the discharge pressure rises to the cut – out pressure and the LE 1000 CONTROLLER cuts out one pump. Application – Transfer and pressure boosting of clean water of community water supply, Apartment Complex, Hotels, Hospitals, Industries, commercial buildings, schools etc.